"The Multivan and Camper GL are weekday family vans that become your home away from home when you head for your favorite recreation spot. Multivan comes with a luxurious interior, a standard pop-up roof and other luxury and convenience features." Luxurious! I enjoyed seeing our Vanagon Multivan in lovely "Bordeaux Red Metallic" prominently featured in the original 1990 Volkswagen dealer brochure. "Located in the heart of the Old Port, Portland Harbor Hotel has a prime location creating easy access around the Portland waterfront," reads the website. The lovely hotel charges guests upwards of $200 per night to be near to the water and the attractions of the Old Port. I felt very satisfied knowing that our slice of Vanagon real estate on Commercial Street was even more prime--and free. 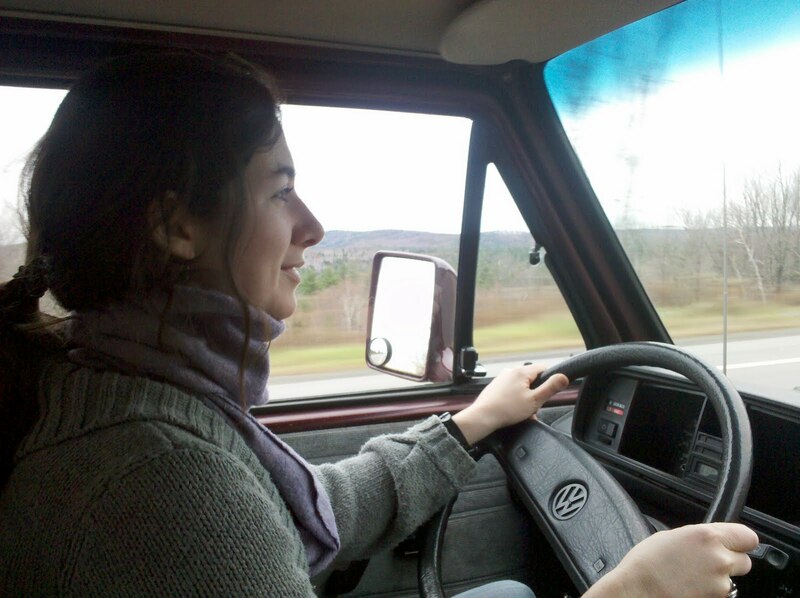 Amanda smoothly steered us north from Portland through Searsport without a hiccup. Route 1 takes a sharp turn into Bucksport, and it was only then that we did some bucking (and stalling) at an uphill on-ramp. The friendly Mainer in the rusty truck behind us knew exactly what was going on and gave us a wave and smile as we jumped out and circled the van for an impromptu change of drivers. It was cold and dreary when we rolled through the gates of Acadia National Park, but the Maine coast is spectacular in any weather conditions. Parker was in dire need of some serious exercise, so we took the scenic park drive directly to Sand Beach. On another coastline that name would seem all too generic, but not in Maine, where pebble- and boulder-laden shores are the norm and softs sands are a rarity. Hoping that the rain would taper, we decided to prepare lunch before making our way to the water. We enjoyed our first meal at the quaint VW dining table while Parker closely monitored all passersby. The lot was full of anxious surfers waiting for the break to improve. More surfers in hooded wetsuits stood gazing at the waves from the shore as they crashed sloppily in every direction. It was not a day for surfing, but a fine day to release our extremely energetic mutt onto the open expanse of sand. We have yet to encounter a body of water that's too cold for Parker. He immediately bounded into the frigid whitewash and enjoyed a good romp with another pup. From the beach we headed to the off-season ghost town of Bar Harbor. We picked up a fantastic bottle of wine for later in the evening and found a short hike on the outskirts of town. Confident that we had finally exhausted Parker into relative calm, we joined the locals at one of the few pubs still open in November, The Thirsty Whale Tavern, for some Maine brews and fresh haddock sandwiches. 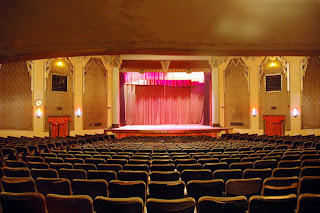 After dinner we checked in on Parker, grabbed the wine, and walked across the street to Bar Harbor's beautiful Criterion Theater. We saw Cairo Time, a film we had never heard of and knew nothing about, but nonetheless enjoyed. 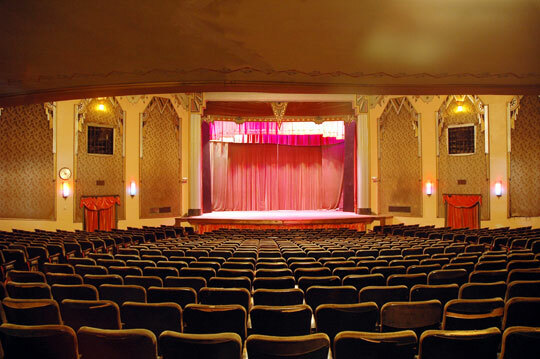 We were the only people in the lower level and with our bottle of wine, it truly felt like a private screening. 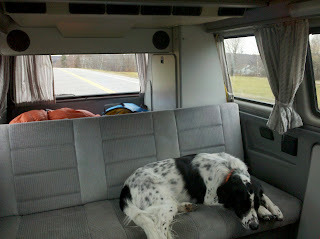 We reunited with Parker and left Bar Harbor behind for a surprisingly busy Blackwoods Campground. Even in November, Blackwoods offers the luxurious amenities of flush toilets, sinks, and potable water. It was COLD, around 35 degrees that night, so we let Parker join us on the bed for our benefit as much as his. We packed up early on Sunday morning for the five and a half hour drive home. We made a quick turnoff at Lake St. George State Park, where Parker again shocked us with another icy swim and manic sprints around the shoreline. From there, it was a straight push back to the city. The inaugural road trip was a success. After a few repairs to make our new van truly roadworthy, we decided it was time to set sail. We headed north on a Friday night with our sights set on Portland, ME. Having not fully mastered the stick shift, I let Jeff do all of the driving while Parker and I did the navigating, although he was enjoying the comforts of the bench seat most of the time. With no real plan for the evening, we found a spot to park the van just past the Ferry Terminal on Commercial Street, conveniently just a few steps away from my favorite bakery in Portland, Standard Baking Co. and the waterfront bars of the Old Port. We prepared the van for our eventual return "home": pulled the curtains, converted the rear bench seat into the bed, and laid out the sleeping bags to make a nest for Parker. While it wasn't quite freezing, the temps were dropping. We said our goodbyes to the beast and headed toward the cobblestone streets. Our first and only stop was Bull Feeney's, where we stumbled upon an excellent guitar and fiddle duo, North of Nashville. After enjoying a few local brews and some dancing, we called it a night. As we approached our beautiful little home on wheels, we found Parker sitting up front in the passenger seat, patiently awaiting our arrival. 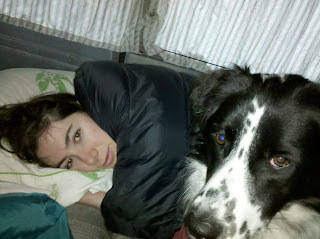 He eventually settled down on his bed on the floor as we in our sleeping bags. The only problem with going to the bars before sleeping in the van is the inevitability of needing a bathroom, if not in the middle of the night, then early the next morning. While this may not have been an issue if we had been parked somewhere remote, it became quite problematic in our urban locale. I was very happy to find that the Ferry Terminal (and their restroom) was open very early the next morning! With coffees and ham and cheese croissants from the bakery, we hit the road again, our sights set on Bar Harbor and Acadia National Park. 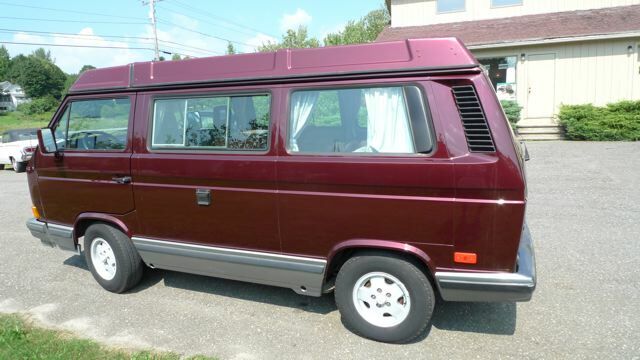 I've wanted a VW Vanagon for half of my life. Maybe the seed was planted during my Phish-loving high school days, when at 15 I first gazed at a colorful fleet of buses and vans--tops popped--from the back seat of my parents' much less interesting Dodge Caravan. Or perhaps it was that always present longing to stay just a bit later in the mountains. On the long stretches of highway following exhausting days of climbing, hiking, or skiing, I fantasized countless times about one day avoiding the weary, bleary-eyed drive home to instead enjoy a few more beers while recounting the days' adventures. 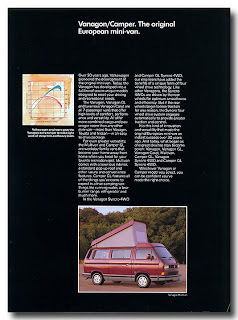 The vanagon was always the missing ingredient to making that dream a reality. 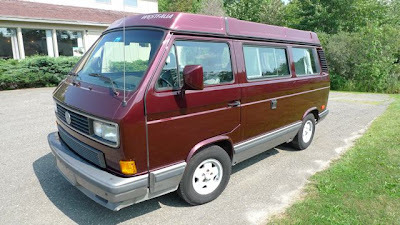 After many, many months of regional crazedlist searching to compliment too many hours spent on The Samba classifieds, I found a very promising listing for a 1990 VW Vanagon Westfalia Multivan located deep in the heart of Maine. A flurry of emails and phone conversations, a long test drive, and a detailed inspection later, I closed the deal and drove home in fulfillment of my longtime dream.